One suggestion: Throw a FEAST, be sure to Invite Neighbors. Honestly, I mostly just sacrificed to Eurmal because someone suggested it in Sacred Time, and I wanted to see what'd happen since I rarely sacrifice to the trickster myself. But the trickster kept true to form and gave us nothing to be excited about...yet. Anyway, to absolutely nobody's surprise, goons want to keep the Raven Banner. Pity, I was hoping for a round of troll votes that made me give it to the Blue Jays or something. Sartar, a weaponthane of your clan, reports a terrifying encounter with skeletal creatures in the forest. "They were like skeletons, yet also like birds, and they had fangs!" Without consulting with the other ringmembers, Loricon rallies four weaponthanes and heads out to do battle with the things. -Sacrifice to Humakt to strengthen Loricon's hand. -Send others to join the fight. 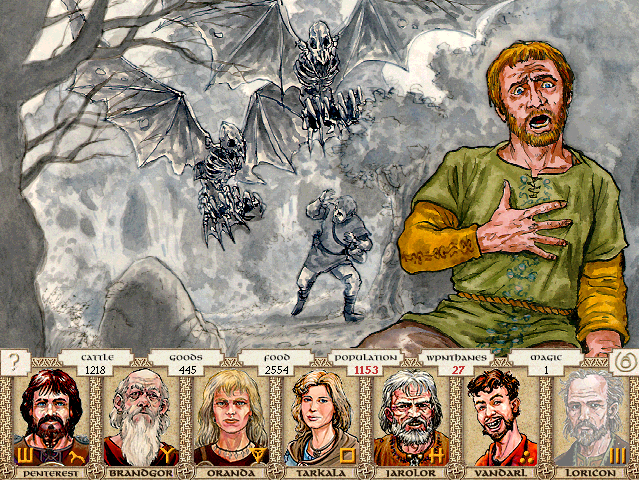 -Send someone to take over from Loricon in leading the fight. -Send more warriors, and someone to take over from Loricon in leading the fight. -Wait for Loricon to return. Send me to lead the fight, and send more warriors with me. Our magic is strong; Humakt will hear our prayers. The carls are no friends of the undead, but they want nothing to do with this. Sacrifice to Humakt, foe of the undead. Loricon hates the undead so much; he will be shamed if we send someone to replace him. The more warriors we send, the more dead we will have on our hands.